In the last two days there has been many astral energy ‘attacks’ on souls, with others from past family connections (as in past of where we are at) that/who are releasing and not dealing with what is coming up and going on for them. By way of ‘projecting’ what is coming up for them onto others….and usually it is not to that person’s ‘face’…it is ‘behind their backs’ or coming on the ‘astrals‘ – covertly. Many who have shifted, grown and are stronger now, have been able to deal with this so much better than in the past. And while it has been very challenging, they have found a ‘newer’ inner-strength that came in with the Solstice energy to handle or deal with this ‘better’. Thank GOD for that, for many of us. Then there are others who are in the knowing of their spirituality yet still learning about the experiencing or implementing the knowing within, who are half and half – in-between in a cross-over of energies, of the old and the new (refer past BB posts). As we are all at different levels/layers of ascension and spiritual growth. This can make it quite ‘tough’ on those who have shifted recently and are stronger, as the old from others comes as a time of say ‘testing’ our faith and strength in the new. To believe and trust in ourselves and to have faith and trust in the Divine and our link to our Spirituality, as this is very much our saving Grace. To not have or want anyone to fill any ‘void’ within…for us to fill with with ourselves of the Divine. To be ‘whole’ and ‘complete’ within ourselves firstly, linking our Soul to our Spirit of the Divine. Over the last two days many couples or partners of many forms found they reached a place of such depth of old anger and more that needed to come up, to be brought out into the open, to be released and healed. And this was a very testing time of really pushing many souls to the brink and beyond…and many are still ‘recovering’ from this. Just know that each soul is doing the best they can with what they have been experiencing, that needed to be released to be healed. There are so many facets of what has been going on, not only in the human, but in the Spirit as well. Those at the ‘forefront’ have been through extremely trying times, that is the truth of it. Yet we are STRONG…stronger than what we may realise. We have not come so far without love, guidance and support of the Divine, the whole way…as we needed to experience what he have in the Human BE-ings we are! Because those who have been diligent and have cleared deeper layers/levels are not feeling what they used to so deeply, as they have cleared their ‘bottom of the barrel’. As we come up and back from the spiritual and out of the old emotions of others, in where we have grown. Our link to the Divine and within ourselves. 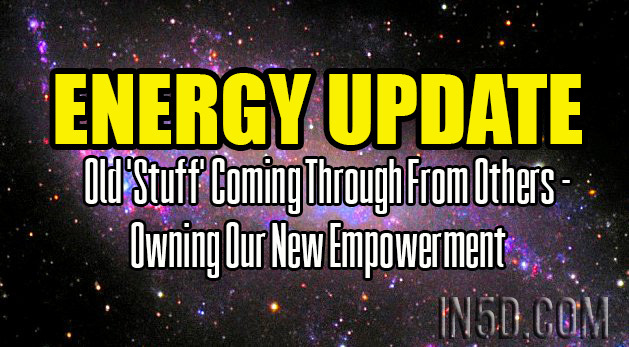 To break through past creative blocks we have had about stepping into our own EMPOWERMENT. You see, this has been part of our souls journey and purpose as well, to have these links and ties, to help us to be STRONGER within Ourselves of the Divine. For us to step up and into our VERY NEW EMPOWERMENT. To ‘claim’ what is ‘rightfully’ ours…our true Divinity. As we are ONE and Love Has Won. And it all starts with us…’know thyself’ dear souls, as this is what will ‘get you through’, time and again.